Broker Latency Tester (free EA to test execution latency) – UltraFX VPS – Moneywheel Research cPlc. WARNING : This test EA will open positions with market order. During testing will generate losses. The losses could be substantial when during testing the volatility suddenly increase. Therefore use it carefully and for your own responsibility. Recommended to use the test during low volatile, calm market period and by an expert trader. On the retail currency market usually the largest part of the overall latency is the execution latency. The “Broker Latency Tester with Market Order v3” will send market order and calculating the time between sending the order and receiving the confirmation. After confirmation the LONG position will be closed. This market open and close circle will be repeated 25 times and the EA will calculate the average of the last 20 results. The calculation will start after the first five circle. The position size has been set for the minimum lot size (MODE_MINLOT). 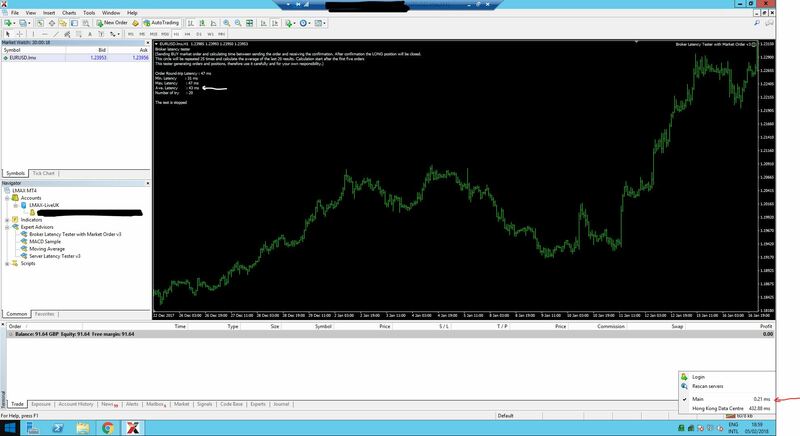 In the picture below we have tested LMAX Exchange with MT4. LMAX Exchange executing aggressive orders 99.88 % time less than 5 ms. Connectivity (cross connect) is very fast. The 0.21ms at right bottom corner is actually the MT4 Server response time for the ping message. Our router latency and the distance latency is on a microsecond level (not even measurable with this tools). Overall the measured 43 ms on average showing the MT4 infrastructure (MT4 gateway, MT4 server, bridge) latency.